The humanitarian tour will provide medical help to the crisis-ridden country, but Venezuelan officials said it was also part of a "strategic defense operation." Pharmaceutical prices have soared as the currency tanks. The Chinese army medical vessel "Peace Ark" arrived in Venezuela's La Guaira port on Saturday, as the country faces a deep economic crisis that has devastated its public health services. It is the latest stop for the People's Liberation Army Navy's ship in its 11-nation "Mission Harmony" tour. 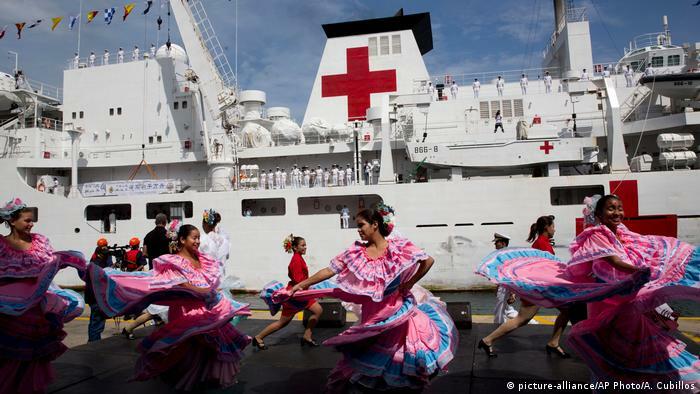 The visit is taking place on the heels of the US announcing that it would also be sending a navy medical ship, the USS Comfort, to help Venezuelan refugees in Colombia, a move that Caracas has criticized. Top Venezuelan officials saw the Comfort's deployment as a threat and a sign that the US seeks a military intervention on humanitarian grounds. Though the stated goal of the Peace Ark is primarily humanitarian, Padrino said its visit to Venezuela was part of the government's "strategic defense operation." "This is how you undertake diplomacy in the world," Defense Minister Vladimir Padrino said in a welcome ceremony, "with concrete actions of cooperation and not stoking the false voices of those who beat the drum of war." (CNN) The White House is not tamping down tensions after national security adviser John Bolton was seen Monday holding a yellow legal pad inscribed with the words "5000 troops to Colombia." "As the President has said, all options are on the table," a White House spokesman said when asked for an explanation of the notes, which were seen during a briefing with reporters about new sanctions on Venezuela. President Donald Trump has refused to rule out military options in Venezuela as the administration ramps up pressure on the country's ruler, Nicolás Maduro. A Defense Department official said on Monday that there are no plans to send any forces to South America nor are any discussions ongoing at the policy or operational levels. There are a limited number of US troops currently in Colombia as part of the Plan/Paz Colombia mission but that number is in the hundreds, the official said. When asked about Venezuela on Monday, acting Secretary of Defense Patrick Shanahan told reporters, "Here in the Department of Defense, we are very closely monitoring the situation." Colombia's foreign minister reacted to Bolton's notes Monday evening, saying he was unaware of the thinking behind them. "Colombia does not know the reasons behind these notes and it is unaware of the real extent of them," said Colombian Foreign Minister Carlos Holmes Trujillo in a statement. "Colombia will continue to carry conversations with the United States on several topics and cooperating with the U.S. in any bilateral topics." In the US' strongest rebuke of Maduro so far, Bolton and Treasury Secretary Steve Mnuchin announced sanctions earlier Monday against Venezuela's state-sponsored oil company that would block about $7 billion in assets and prevent $11 billion in assets over the next year, Bolton said. Maduro faces a challenge from self-appointed interim president Juan Guaido as the nation becomes increasingly unstable. The embattled Maduro alleged Sunday that the United States has facilitated a "coup" to undermine him, referencing reports that US Vice President Mike Pence had pledged America's full support to Guaido. Venezuelan Defense Minister Vladimir Padrino said Monday that the military is "ready to die" for its homeland, after Venezuela's military attaché in Washington, Col. José Luis Silva, defected Saturday and publicly backed Guaido. MOSCOW, Russia – Russia’s Deputy Foreign Minister Sergei Ryabkov has stated that Russia strongly warns the West against risky ideas of pushing forward a scenario of force in Venezuela. “It is difficult to predict its consequences, but it is clear that the hypothetical use of force in this situation will lead to a wave of bloodshed that would have consequences outside of Venezuela,” Ryabkov said. According to the Russian diplomat, military intervention in Venezuela’s internal affairs is the worst case scenario and its consequences will affect not only Venezuela but also other countries. “I emphasize that we did not want to make such predictions, we only once again give a serious warning against such adventurous ideas if they exist among some responsible politicians in the Western Hemisphere,” the deputy minister said. In addition, Russia is concerned that the participants in the contact group for Venezuela do not appear to be paying any attention to the internal dialogue in the country during the meeting in Uruguay. “We are concerned that, according to the information received, less attention has been paid during this event than was previously expected, when only Mexico and Uruguay had such initiative on the subject of dialogue on the subject of internal reconciliation of Venezuela,” Ryabkov explained. The opposition leader has been backed by the US and some other countries. Russia, China, Mexico and Turkey are among the nations that express their support for Maduro as the country’s legitimately elected head of state. Cuba, with economic problems of its own, has sent what the administration says is up to 25,000 military and intelligence personnel — and Havana says are medical and educational personnel — to Venezuela in exchange for free and subsidized oil. Juan Barreto / AFP | A painting depicting Venezuelan President Nicolas Maduro is displayed by a supporter during a pro-government demonstration in Caracas on March 23, 2019. Sergei Lavrov reacted later on Monday by releasing a statement accusing the United States of plotting a "coup" against Venezuelan President Nicolas Maduro. TWO USAF B-52 strategic bombers over the Baltic Sea, near the Russian exclave of Kaliningrad. You can bet Su-27's will be scrambled to 'intercept and chase away'. A third B52 has arrived to the Baltics. Two B52 are joining up from Latvia and Lithuania. #Russia deploys S-300 to Baltiysk, Kaliningrad, after USAF B-52H flybys. Last edited by vector7; March 25th, 2019 at 19:54. Following the major weekend development of Moscow unambiguously asserting its 'red line' concerning potential US military intervention in Venezuela, for which Russia sent a military transport plane filled with Russian troops which landed in Caracas Saturday, new satellite images reveal a major deployment of S-300 air defense missile systems to a key airbase south of Caracas. As we reported the flight came just days after a high-level meeting in Rome last week, during which Russia reiterated a grave warning to the US – Moscow will not tolerate American military intervention to topple the Venezuelan government with whom it is allied - thus it appears Russia is taking no chances with its South American ally. And just a day following the contingency of Russia troops landing in Caracas, Maduro's National Bolivarian Armed Forces have reportedly activated S-300 missiles after completing military drills that previously took place in February. The professional monitoring service Image Satellite International (or Image Sat) has published satellite imagery it analyzed, showing additional S-300 missiles that have been deployed to the Captain Manuel Rios Airbase in the Guarico state of Venezuela. 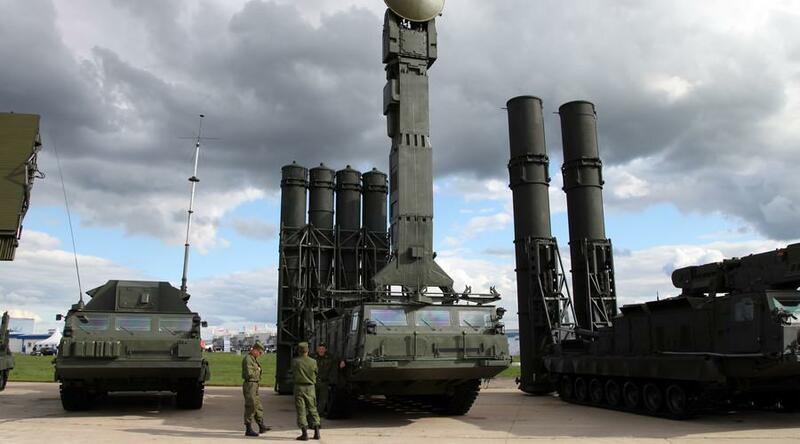 No doubt, the timing of the S-300 redeployment is purposeful, meant to send a strong message to Washington, though it remains unclear just how active the Russian military will be in Venezuela. Image Sat commented on the new images: "The deployment includes five launchers and a 9S32ME multi-channel missile guidance radar (MMGR). Venezuela increases its operational readiness due to regional tension." All of these developments signaling closer Russian-Venezuelan military-to-military cooperation in the face of Washington saber rattling come after three months ago the two allies held military exercises on Venezuelan soil, which the US at the time had condemned as Russia encroachment in the region. But now with a high level Russian commander on the ground, and with Russian-made S-300s under the control of Maduro forces, it is unlikely that the US will act forcefully following the failed coup attempt of the past two months. Ha! was just about to post this. Passing this along with the caveat it's A) from ZeroHedge, B) they're quoting some news source I've never heard of, C) I'm not seeing this being reported by more reputable sources. Venezuelan strongman Nicolás Maduro is giving Russian and Chinese military forces the ability to better infiltrate the American mainland, a Republican senator warned Thursday. Scott, a member of the Senate Armed Services and Homeland Security committees, argued not just that “the United States must consider the use of military assets” to deliver humanitarian aid to Venezuela over Maduro's objections. He raised the prospect of a full military intervention to overthrow the regime, saying that Venezuela has turned into an important theater of “great power confrontation” among the United States, Russia, and China. The United States and other Western democratic powers recognized opposition lawmaker Juan Guaidó as the interim president of Venezuela in January, after Maduro claimed to have secured another term as president in an election that international observers condemned as fraudulent. The Venezuelan constitution gives the legislature the power to authorize "foreign military missions within the country,” but it has not yet made that request of the U.S., perhaps due to doubts about how Trump would respond. “If the Venezuelan people, through their elected national assembly and their own laws and constitution, request assistance to restore constitutional government and democracy, we should be ready to answer that call,” Scott said. Maduro has defied Western pressure with the assistance of Cuban security forces, as well as Russian and Chinese support. Russia, which startled U.S. officials in December by sending to Venezuela for military exercises two bombers capable of carrying nuclear weapons, dispatched about 100 members of the military to repair Maduro’s S-300 anti-aircraft missile defense system after a nationwide power outage in March. That blackout exacerbated a humanitarian crisis that has driven millions of Venezuelans to seek food and medical treatment in neighboring countries such as Colombia. "The United States needs to start considering the use of military assets to bring aid to the millions of starving and sick Venezuelans," Scott said. "And I call on all of our allies and those supporting Guaidó to help us in this effort." Maduro-aligned forces blocked a U.S. effort to deliver humanitarian aid in cooperation with Guaidó in February. Maduro's Russian-made air defenses raise the risks for any U.S. military operation over Venezuelan skies. And Scott acknowledged that American neglect of Latin America in recent decades has undercut intelligence-gathering in the region. “If you look at the amount of military assets we have dedicated to this hemisphere, it’s pretty weak,” he said in discussion with Roger Noriega, an AEI visiting fellow and former assistant secretary of state for the Western Hemisphere. “I think that’s why ... you’re seeing Russia is going to continue to build up assets." Trump's national security team shares that concern while recognizing that it has not been as "easy" to dislodge Maduro through diplomatic and economic pressure as some in the administration thought it would be. Scott allowed that a peaceful transition would be ideal, but he believes the crisis is more likely to degenerate into a conflict like the Syrian civil war. While he supports U.S. sanctions, he wants Trump to expand the toolkit to include military force if the sanctions fail to crack the regime.